One of a series of colour etchings published by T McLean of Haymarket, London. 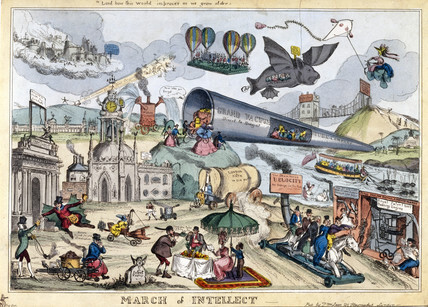 Paul Pry's 'March of Intellect' series of satirical prints was published between 1825 and 1829, lampooning the political isues and reading habits of the day. Here, inventions, architecture and fantastical modes of transport are satirised, including Gurney's wagon and other steam transport, a vacuum tube system for travel to India, air transportation and an imagined bridge link to South Africa. There is even a giant bat for transporting convicts to Australia. 'March of Intellect', 'Lord how this world improves as we grow older', 1829. 'March of Intellect No 2', caricature, c 1827.